Like many busy engineers when new software features are released I don’t always read the manual. I figure out what I need to use the new features in my work flow, and get to mixing. The 32bit floating point engine in Pro Tools is a case in point. I like high resolution so 32 bit floating point is better right? Well maybe not. It all started a few months ago when I received 32 bit files from a live concert series I was to mix. I kinda scratched my head, why 32bit? This was a multi feed off a PA console. The converters must have been 24 bit so these files were larger but contained no more information than 24 bit files. Why should I care? Hard drive space is cheap so no problem right? Wrong. I like to ram load my audio files when mixing by setting my disc cache larger than my audio files folder. This session being a live concert over an hour long, these multitrack sessions were huge. Big files means a lot of RAM used, more Ram for session load equals less RAM for processing. A thought occurred to me, ” why can’t we have a 32 bit session with 24 bit files?” Well you can. Last week I received more files to mix. 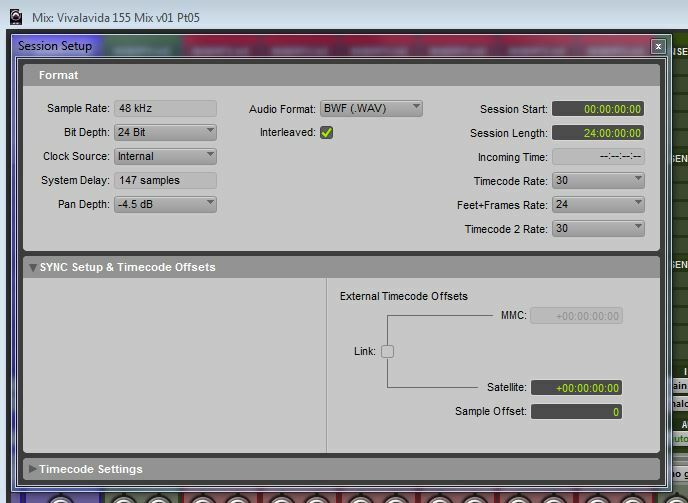 I opened the audio files in VLC to see the bit depth before creating the session. I misread the file, I thought it was 32 bit it wasn’t. So I created a 32 bit session and went to import the files. Pro Tools told me these were 24 bit files but could be imported directly into this 32 bit session without converting. Hmmmmm. So I can have 24 bit files in a 32 bit Pro Tools session. This inspired me to do a bit more research. Looking up online I learned Pro Tools 12 is ALWAYS using a 32 bit floating point mix engine, regardless of the bit depth of the files. 16 and 24 bit sessions still use a 32 bit floating point mix engine. But Track freeze, I don’t want to loose resolution when freezing tracks. I looked at preferences in my 24 bit session and track Commit/freeze can be done creating 32 bit floating point files. So I figured if you want to” bounce to disc” a 32 bit file you would need a 32 bit session, so I checked the bounce to disc settings, sure enough 32 bit floating point was available in a 24 bit session. So the mix engine is always 32 bit floating point. Track commit and bounce to disc will allow to output to a 32 bit floating point file in a 24 bit session. I use bounce to disc, I know many engineers print mixes by recording to a stereo (or 5.1) audio channel. If you do that WITHOUT going to external analog gear this is the only advantage I can see to a 32 bit floating point session. If you go through analog summing etc. your converters will chop the audio down to 24 bits. 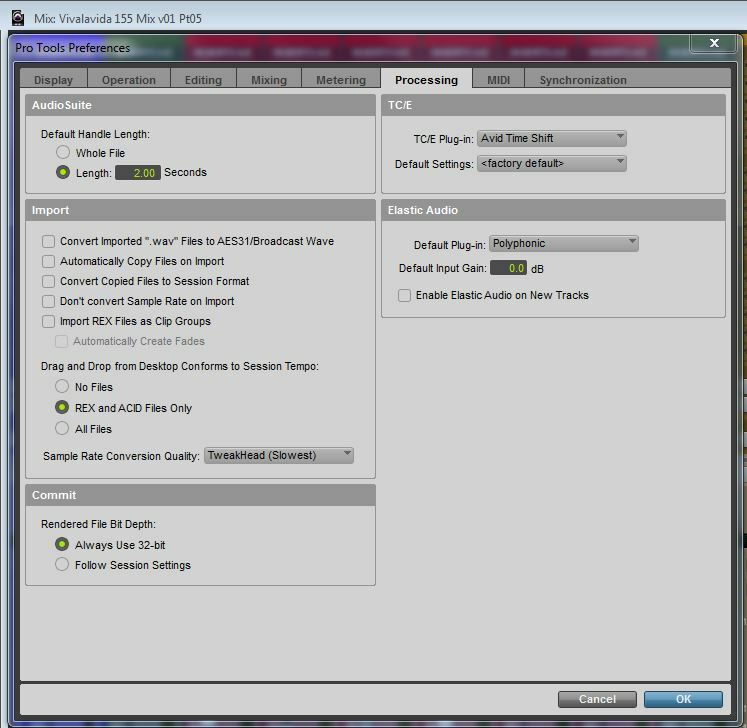 Even if you print stems or mixes in the box to audio tracks using internal busing there still is no point in tracking in a 32 bit session. 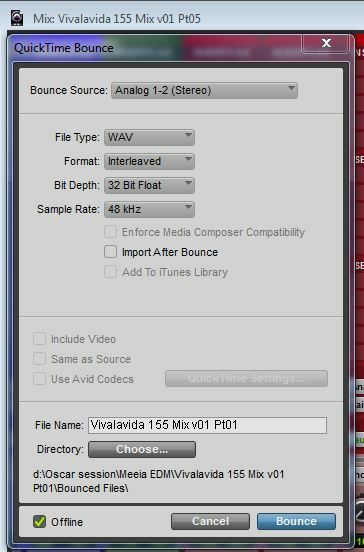 Record smaller 24bit files then when mixing import the 24 bit audio into a 32 bit floating point session. More Mixing for the Taiwan. I know I need to get some fresh posts on my blog. I’ve been very busy at the studio and all my free time has been devoted to finishing up my Analog Tape Machine Alignment Instruction video which will be out soon. In the meantime, check out Preservation Audio Blog. Click on the articles to load up pages full of old pro audio brochures,schematics, and studio pictures. Really great stuff! This is a link to my friend Glenn Berger’s blog. Glenn and I have a few things in common. We both started our careers very young, right out of high school. We both were trained by Phil Ramone at the peak of his career. Glenn preceded me by a few years and was already a staff engineer at A&R when I started, I doubt he was more than 22 or so at the time. After many years in the music business Glenn became a shrink, I just went to one.